Pole planting is where the ski pole on the inside of a turn, is put into the snow briefly during a turn. For general parallel turns, pole planting helps us with timing our turns, but when used with short turns, in moguls or in powder, pole planting also helps us to turn. This page concentrates on using pole planting while making parallel turns. Using pole planting in for short turns, in moguls and in powder are covered more in their own sections. When first learning to ski, using poles or even having them with you, is not important as they distract people from what they should be concentrating on, and are generally more of a hindrance than help. Once you are at the standard where you are doing parallel turns though, they start to become a lot more important. For a decent skier pole planting is used a lot of the time in the manoeuvres that they perform. A pole plant should always be made on the inside of a turn, with your arm out in front and just to the side of you, with the elbow slightly bent. The pole is put into the snow as your movement comes to straight forwards along the skis, at the same time as you change the edges on the skis. This point is not when you are pointing straight down the fall line, but is before then (as shown in using resistance). 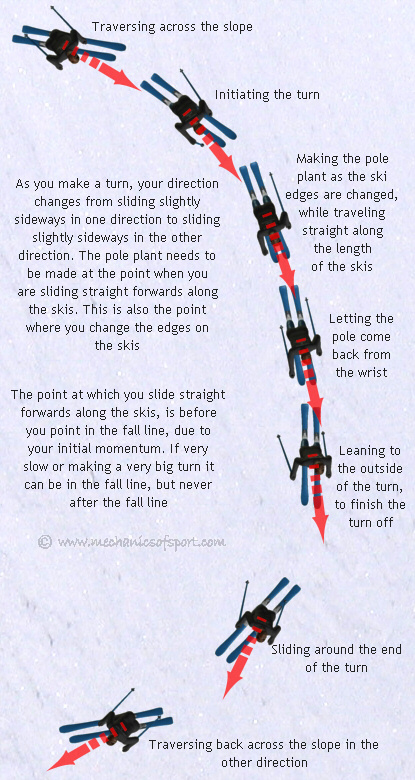 It is the point at which the skis are traveling straight along their length after having stopped sliding sideways from the initial traverse, and are about to slide sideways in the other direction, out of the turn. The pole touches the snow close to inside ski, within the first quarter of the skis length. Once the pole is planted, it should be pushed straight backwards by the snow, and is allowed to move back by letting your wrist move, the arm should stay where it was. If the pole is put into the snow too early (i.e. before you change your sliding direction) the pole will be pushed towards the inside ski, and you may find that your ski hits the pole. If the pole plant is too late the pole will be pushed away from the ski more, and will not travel straight backwards. 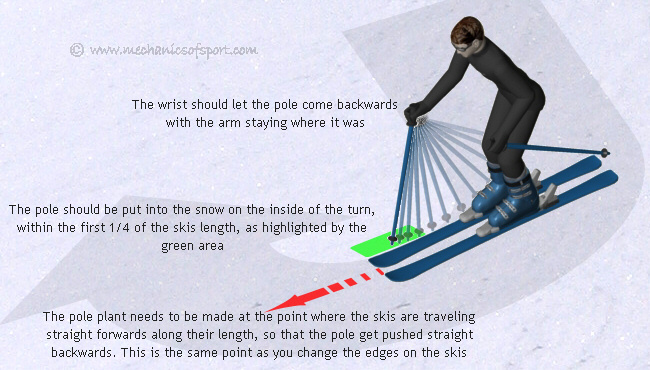 It is important that the pole is allowed to move backwards from the wrist, as this side of the body needs to come across the skis while coming out of the turn, to keep the correct stance. If the pole is allowed to make the upper body move, it will push the shoulder back twisting the body out of position. For pole planting in parallel turns it is not important to put any real pressure through the pole into the snow, the point at which the pole plant is made, marks the middle of the turn with the skis traveling straight forwards, and enables the skier to get into a nice rhythm of making turns. Although letting the pole touch the snow lets us know if we have made the pole plant at the right time or not, by the direction the pole gets pushed in. Especially when traveling faster, whether the pole even touches the snow or not, is not so important, as you can find that the pole just gets pushed away too quickly, and that it is easier just to use the motion, without letting the pole actually touch the snow. In powder, moguls and short turns, is where the pole plant is the most important. In these the poles can be used as a pivot, providing some resistance to help turn your skis. This uses a slightly different technique though and is explained further in the off-piste skiing, mogul skiing and short turns sections. Below is a walk through explanation of how to make a pole plant while making a parallel turn as described in the parallel turns section. Coming across the slope we have our body turned slightly towards the fall line, with our arms out slightly in front of us just to the sides, our elbows slightly bent, and the poles pointing behinds us at about a 45 degree angle to the snow, as with the normal stance for traversing across the slope. As we initiate the turn by bringing our weight evenly to both skis and leaning forwards, we bring the inside arm forwards more, bringing the pole vertical or even slightly forwards, in preparation for the pole plant. Note that we bring the arm forwards without twisting the body, as to maintain a good stance. As we turn more our body will start to flatten off to the skis letting the pole come further forwards naturally. At the point where we are just changing the edges on the skis, and are traveling straight forwards along the skis, we push the pole down into the snow gently. We allow the bottom of the pole to move backwards until it comes out of the snow by letting our wrist move, keeping our arm in the same position. We then steer out of the turn putting our weight on the outside ski and bring the pole back to pointing behind us diagonally to the snow, moving our body in to the correct stance for going the other way across the slope. 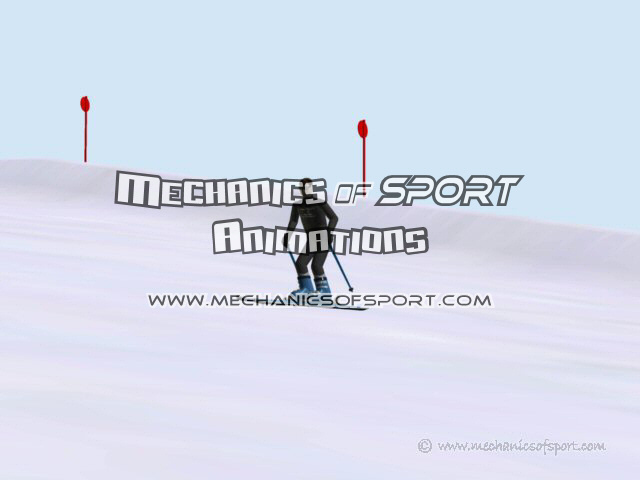 The animation shows the 3D skier doing 2 turns with pole planting on the virtual ski area. On the first turn you see the pole plant from in front, notice how the pole plant happens before the skier points straight down the slope. On the second turn you see the pole plant from the side, notice that the pole plant is made just as the skis become flat to the snow. Making the pole plant on the outside of the turn - The pole plant should be on the inside of the turn, think of the point where you make the pole plant as a pivot which you turn around. Not putting the pole far enough forwards into the snow - The pole should be put into the snow within the first quarter of the ski's length. Making to pole plant too early or too late - As explained before you can tell if you have made the pole plant too early or too late by the direction the pole moves in, pay attention to the direction the pole moves in so that you can correct yourself. Letting the arm come back and bring the body out of position - The arm needs to stay out in front with the pole coming back from the wrist, if the arm comes back it will push the body out of the correct stance. Until pole planting becomes more natural, it's best to practise them while making slow turns, so you have plenty of time to think about what you are doing. You can then get the technique right before going faster, or increasing the tempo of your turns. 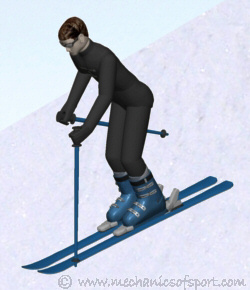 Taking ski lessons will introduce you to skiing exercises based on how people learn to ski in real life, so that you learn to pole plant with the correct technique. Move on to the Flat Lining section.